Here we go! The final plan has been...finalized. Click here! Very excited to see everyone. Check your emails as well! We will be driving the Coast Mountain Circle Route. This will be a stunning vacation/drive combo. 400+ miles of coastal, mountain and canyon highway over 2 days. We will start and finish in Metro Vancouver near the USA/Canada border. Beautiful, scenic PNW sights and attractions will be planned throughout the trip. I’ve planned this as more of a drive/vacation combo to make it more worth it for people who may want to travel here alone or with significant others/family. We won’t just be in our cars, but the driving will be great. If you want to split off at our stops and meet up later, this drive is designed to accommodate individual/small group activities. Budget wise, we’ll pick restaurants that are casual, making reservations as the date gets closer and we have defined number of participants. The Sea to Sky Gondola is worth it. The rest is up to you regarding what you want to do in Whistler and where you want to sleep. Driving wise, the second day will be heavier in terms of mileage as it is mostly mountains and canyons from Whistler onwards back to the Vancouver area with little in the way of attractions/towns. Just nature. The route follows a set Highway with no real options for deviation and lots of stops. We should also be within cell range most of the time. If you are planning on attending, please fill out the RSVP here. Bring appropriate jackets for Spring in the PNW. Bring adequate parts/emergency equipment if needed. You can get the detailed maps of the drive from BC’s Tourism site here, the drive is described below in point to point form with map links. The dates are May 11th and May 12th. Cross with full tanks. Gas is quite expensive here, and we won’t be stopping for fuel until Squamish. The first meeting point will be 10am PST at Pacific Gateway Village in Surrey, BC. Close to both main border crossings. Just take I-5 and get off at exit 275. Once you cross into Canada, it’s just a few miles North on your left (heading North). In order to better accommodate Vancouver dwellers/assist in possible separation scenarios through Metro Vancouver, we will then drive to a Starbucks in North Vancouver near the highway and then departing at 11am PST. This is so people west of Surrey, BC don’t have to first drive east. From Starbucks, we will drive to Porteau Cove Provincial Park for photos and a break. From the Porteau Cove, we will make the short drive up the Sea to Sky highway to Sea to Sky Gondola. It’s $40CDN to go up, but it’s stunning with hiking, the suspension bridge and views. We will spend some time here to make it worth it. Parking is ample here. From the Sea to Sky Gondola,we will drive to Squamish for lunch at Howe Sound Brewing and to fuel up at the Chevron in town. Then on to Whistler. Once in Whistler, we will park in this lot or at your accommodation of choice and have dinner in the scenic Whistler Village. We will spend the rest of day 1 here. There is ample accommodations at every price range and camping around the town if so inclined. Highlights of the village include walking, shopping, sightseeing, gondolas, clubs and hikes. The next day, we will meet for breakfast coffee and begin the drive from Whistler, back to Vancouver via Pemberton, Lillooet and Lytton. As mentioned in the “About the Trip” section, the second day is nearly pure driving. 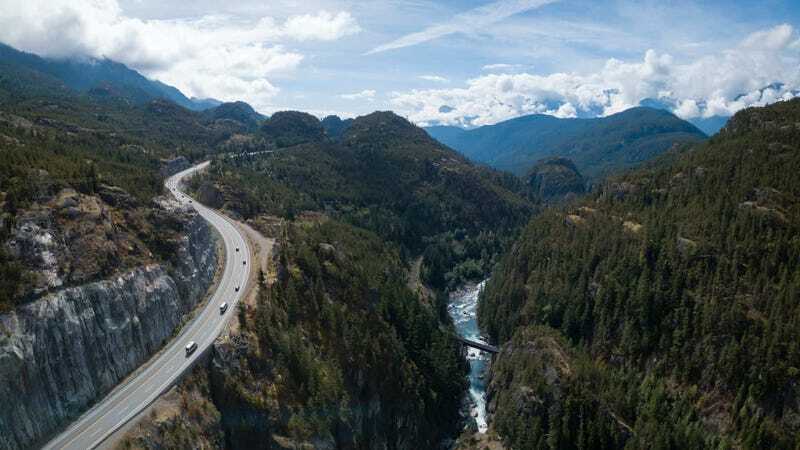 We will stop at Hells Gate in the Fraser Canyon to take photos and stretch our legs. From there, we will continue down the Fraser Valley back into Metro Vancouver. Those who need to go back to the USA may or can stick around for a post drive beer in Fort Langley.